Re: EEVblog #1132 - The 3 Cent Microcontroller! If it can replace a 555 its all chicken dinner! All kind of oddbal manufacturers there, i actually is looking for SPDT analog switch sot23-6 5V from the regular channels, Farnell dosent even sell such a thing but found one on Taiwan LCSC. Yes show us how easy or frustrating it is to build a project with it! Do they cost more to ship than they do to buy? Watching Dave try to build a simple project with one of these MCUs is going to be priceless. I've always wanted to give them a try just for fun. Has anyone here ever tried one of these? That IDE looked a bit outdated, but it has a lot of functions that would be nice, specially for ARM development where you have to set a billion registers to setup peripherals the way you want. By the looks of it these MCUs are almost always used for simple tasks and the developers just use the generated code and modify it slightly to fit the application. Sorry to burst the bubble, but that's not the real price. How do we know? - The price is much lower than for comparable Chinese / Taiwanese micros. - Nobody else in Shenzhen is selling them. Yes, you can not buy this thing in Shenzhen, only lcsc has 500 in stock, and that's nothing. It looks like lcsc (The large go to distributor in Shenzhen) gave Paduk (a very small and relatively new Taiwanese mcu designer) a try and bought a bunch of their parts in 1K quantity. Now they are selling them off just to clear the inventory. If you want cheap micros that are going to be available for the same price in the foreseeable future, try Holtek and STC. Holtek is Taiwanese and they have very decent English documentation and tools. STC is Chinese and used to have a Chinese-only website that would give regular visitors eye cancer. I see they updated the website and now have an English version. They are even translating the datasheets, but expect a rougher experience. In any case, the cheapest Holtek HT48R002 OTP micro is just 9 cents on lcsc, and you can get it for 6 in reasonable quantity in Shenzhen. Yes, it's still very cheap, but not 3 cents in quantity of 10 cheap. Id really like to see him have a go at the cheap microcontrollers as well. I have also heard that the Holtek ones are the best to try as they have been around for a while, noted for being the cheap ones and where some brave folk have had a go. I think the data sheets used to all be in kanji but have better english transcription now. It would be interesting to see it programmed in pure assembly instead of the odd asm/C hybrid. And also good to know if they can be programmed using some bit bashing from the IO of something else like a PIC / Arduino / Raspberry or similar instead of using a special custom programmer. Probably but recall that lcsc is part of the jlcpcb group so if you get some PCBs made and pay for their shipping then you can get components from this supplier tacked on to the same shipping consignment. I have done this and got "free" shipping of the components for an old jlcpcb board. The IDE probably does not have that compile menu rubbish, instead it may write directly to the programmer. How likely would that company still be in business in the near future? Maybe the chips would become super valuable in 30 years or so. While these prices are literally order of magnitudes of impossible at digikey... here is the question: are these reliable and for real? I mean, are 24-bit ADCs listed above really does what it claims?! then why will we buy significantly more expensive ones? Yeah, HX710 and others are legit. But they are digital scale ADCs, not general purpose ones. Can you load code into ram over debug then run it, or do you have to brick one IC every time to try your code? I suspect it is strict Harvard architecture, so no execution from RAM. There's only 64 bytes of ram on the thing anyway. You pretty much have to put the program in the 1K words of rom. Meaning I cannot use them for in a lab power supply design? why? Do you have any evidence of that? Or are you just speculating? As for new, 2005, so been around 13 yeras. The problem with these devices for many uses is their DC offset. The DC offset in most sigma delta ADCs is not great, and may drift around with temperature and power conditions. In weight scale applications you can measure and subtract the offset each time you start the scale, and assume the temperature, and other factors which can cause the DC offset to drift, won't change too much before the scale is reset again. If you do not have a practical scheme like that for calibrating away the offset, the ADC might not be for you. You are right, not that new. Aha, what about the other ADCs\DACs listed aside from those? I mean the 16 bit ones as they seem so cheap and there is nothing in their datasheet to indicate for weight scale application specific. We will see if the stock is restocked we will know the answer. In the past I had a similar experience with a chinese seller who sold STM32 microcontrollers for $0,80. I ordered 100 pieces and he sent and billed me 34 pieces. I asked him when the other 66 pieces would be shipped and he answered never, out of stock. At my further inquiries he admitted purchasing a leftover reel in the past with couple of hundred pieces left and just offers what he has. LCSC looks like a big company so I am really interested to see how this turns out. Actually there are at least two other distributors in SZ and Padauk have an official distributor with full app engineer support in SZ (who can also do pre-"flashed" chips). I do suspect the price could go up if the part gets very popular... ST pulled that trick with STM8 before. BTW there "multi core" chips are also very interesting... they are why I got talking to Padauk in the first place. What they are is essentially a single core but it can task-switch between multiple tasks on every execution cycle (so it must have multiple register and PC sets). Which can be very useful for protocol conversion as you could bitbang multiple protocols at once. Their other advertised use case is for motor controllers (and it looks like they have a pre-programmed chip for that application). Also the power consumption figure Dave skimmed over was actually for executing code from the LF clock... which is pretty impressive. There could be some good use cases for that like low power sensor monitoring. Is there any other Chinese/Taiwanese Digikey site like this one ? Dave: while you're at it, hedge your bets and grab the programmer for a few other brands too. If this one doesn't pan out ("oh the IDE is free, but compiler costs $2K and we only tell you if you ask ") then you'll have some other options. You may also want to make a little finger-pressure adapter board for test programming the OTPs. Use a large, unconnected SMD resistor to make a 'wall' that you slide the components up against with your finger. Next to this place the ENIG pads the part is held against. The SMD resistor should have its dimensions reasonably specced, make sure to make the pads tight too. Put three duplicates of this circuit on a board with a tiny variation in resistorwall<->pads spacings to allow for tolerances when you use it IRL. It's also worth wiring an unused pin on the pads to an LED+R for a quick-n-dirty self-test of your code writes. Even if you don't end up using it. Alternatively you might plan to do emulation + in-circuit programming from the start. YMMV. Just a small point Dave, but if you have your computer set to run executables that are clicked-on without even asking for confirmation, then you are at high risk from drive-bys. Point of fact I would check all such software on VirusTotal. and/or run it in a virtual machine, at least until I was sure it was OK.
Dave can you master your audio so its sitting closer to the Youtube reference level/.. .this one is -7.1db down, so its really quite quiet. And what exactly is that reference level, everyone seems to have their own idea. The reference level that matters for sending to youtube is youtube reference level. If you check on your video ( right click, -stats for nerds ) it will show you what your program loudness is. In the case of your video you are -7.1db down. You dont' want to start going over the reference level becuae then Youtube does nasty normalisation of your audio. ( not compression, but normalisation ). You want to target -13LUFS for Youtube ( loudness Units before Full Scale ). You can measure that with a 'Loudness' Meter which is often a plug in in many of the video/audio editing suites. How about a simple project using that font chip as well to send (say) serial data received on one port to a graphic LCD on another? I am not sure but you are noticeably quiet. Perhaps go for the BBC World Service ideal of 100% peaks and a high compression ratio? Would help the elderly amongst us too who went to too many rock concerts in their youth. That doesn't help Dave get the audio level correct in his videos in any way. Never said it would, notice I am responding to a quote from G0MJW. Last time I checked, volume normalization on my TV worked incredibly well. If you can't get TV producers to have consistent volume (see all the loud ads they had for years), then do you expect all of youtube to achieve the same? > Now they are selling them off just to clear the inventory. I'm that guy and Dave beat me at writing about the .03$ chip. The whole writeup about the arm chip is at my blog, including how to program it. The link to the post is http://smdprutser.nl/blog/the-arm-chip-that-wont-cost-an-arm-and-a-leg/ i also have some chips (which are sold out at lcsc.com) and breakoutboards available. I don't know what IDE and programmer is used with these things. However, I assume they will be usable to everyone once someone includes them in Arduino IDE.... I really hope this happens. On my github there is a Makefile, crt0.s and library file to write your first program. It uses the gcc-arm-none-eabi toolchain. Yu can program it with the blakcmagic probe (use my firmware) or a J-link Segger. Don't think this chip is suitable for the arduino crowd.. It is one time programmable, so yes it won't suite arduino people. However, using arduino ide and libraries will make it significantly easier. The only microcontroller that I dealt with directly is PIC. I have an avr programmer that works perfectly and a pickit3. I don't know of any easy method to program these devices, especially how to know if the program works before burning it to the chip itself. have you read the links I posted? Crazy. You can also find Panasonic electrolytics on LCSC for a fraction of what Digikey and Mouser charge. Shipping is the same. Has anyone found a single Padauk chip in the wild in an actual product? If they have been around for 13 years there has to be some out there. Note the stock differences, digikey has over 100000 pieces while lcsc has 300 , what do you think what happens if those 300 are sold out ? If you order 10000 pieces you probably get nothing. Great effort. Would you mind contacting the BlackMagic project to get your patches folded in upstream? PM me if you need to know how to do that, but its easiest to contact via Gitter. I saw and I don't care. I need one, but at that price I'll order ten. There are tons of products with unmarked 8-pin micros, so this could be one of them. LCSC seem to be just using blank component images, to make their website easier/quicker/cheaper to implement and maintain. You can see thier logo, on the chips below. A short comment about the 0 to X MHz in the datasheet which seemed a surprise. Actually this is an important parameter to know about. It means you can shut the clock down completely without problems. Not all processors allow shutting the clock down! I send a pull request, but need to rebase/merge some things first. You mean like their own literature? They may mark the larger pin chips as the cost of those is higher. Your're right. 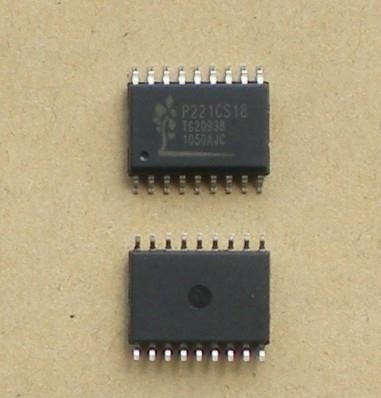 Many of the ICs and stuff on LCSC, does seem to have the correct/actual photograph, complete with actual part number. So I'm NOT sure, if the 3 cent micros, are labeled or not. But since the LCSC seems to show no marking on the chip, you could easily be right. (Changing the subject a bit), as well as cutting costs to save on printing the label. I'm surprised that, at only 3 cents, the micros are packaged. I.e. at only $0.03 each, I would have thought they would have to be COB dies (i.e. Chip On Board). Russia/Padauk meddling to influence my next Digikey purchase! Don't forget the STM8. ST may be a European company, but they still make very cheap µCs. Actually, it seems the STM8 are currently cheaper even at Digikey compared to LCSC. Parts of ST are apparently attempting to move STM8 customers to the STM32, and have been doing so for quite a while. Maybe the price increase was part of that? It seems LCSC only has a feww Puolop devices in stock, which does notinclude teh Puolop ow-end parts. So I don't know if Puolop could be a cheaper alternative to Padauk for those. To work with OTP devices, in general you buy the windowed version to use in the lab, it is usually 10 times more expensive (30c? Ha ha) but you only need a few of them. For instance, I have several tubes of regular plastic packaged PIC12C508 and two of the same silicon in a fetching gold framed windowed package, you put them in the UV eraser to reuse. (Ah, memories...) I also did this with COP8SAC7, now I have several boxes containing hundreds of surplus OTP MCUs, but have lost the windowed parts and the debug module, searched for them in the factory a while ago with no luck. Perhaps an etch job is called for, or sell them @ 3c?? Puolop is cloning most 1-core and 2-Core OTP Padauk devices. Datasheets seem identical even down to version number and dates in the Changelog. Unlike Padauk, Puolop does not offer Flash or 8-Core devices. Recently, Puolop is making their own 1-Core OTP devices based on the Padauk architecture (e.g. the PTBO164SX, first and so far only version of datasheet from 2017, does not seem to have a Padauk equivalent).